With the prologue on the Paul Ricard Circuit on Friday at Le Castellet in southern France, the countdown for the start of the Sports Car World Endurance Championship WEC on 12 April in Silverstone began. In addition to the Porsche works drivers Jörg Bergmeister (Germany), Michael Christensen (Denmark), Wolf Henzler (Germany), Richard Lietz (Austria), Frédéric Makowiecki (France) and Patrick Pilet (France), all contesting the WEC including the 24 Hours of Le Mans in the Porsche 911 RSR, Porsche Junior Sven Müller (Germany) also takes part in Le Castellet. He makes his race debut at round two on May 2 in Spa-Francorchamps with the 911 RSR. The Porsche 911 RSR, based on the seventh generation of the iconic 911 sports car, is characterised by a consequent lightweight design and sophisticated aerodynamics. At its first appearance at the 24 Hours of Le Mans in 2013, the winning racer from Weissach scored a sensational double victory in the GTE-Pro class. Last year it won America’s three most prestigious long distance classics: the Daytona 24 Hours, the 12 Hours of Sebring and Petit Le Mans. Victories at the WEC races in Silverstone and Shanghai also went to the 911 RSR. Its six-cylinder boxer engine in the rear has a capacity of 3996 cc and produces around 345 kW (470 hp) with a restrictor. During the winter months at Porsche Motorsport in Weissach, many details were modified on the Porsche 911 RSR, which is liveried with the wording “Porsche Intelligent Performance” shown from a bird’s eye perspective. The revamped aerodynamics at the front and the adapted chassis kinematics ensure enhanced balance and improved control at its handling limits. Thanks to minor tweaks, the reliability of the drivetrain was further improved. Single point refuelling ensures additional safety in the pit lane: The refuelling system utilises one hose for both filling and venting, leaving only one refueller to work on the car. 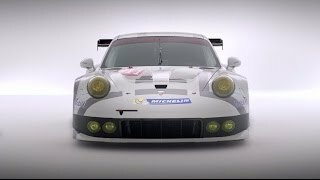 For 2015, the Porsche Manthey squad fields a pair of 911 RSR sporting the starting numbers 91 and 92 in the Sports Car World Endurance Championship WEC. Again this year, the 24-hour classic at Le Mans is the ultimate highlight of the season. At round two of the season on the challenging storied circuit of Spa-Francorchamps in Belgium’s Ardennes, Porsche Junior Sven Müller contests his maiden race for the Porsche Manthey team with the 911 RSR. 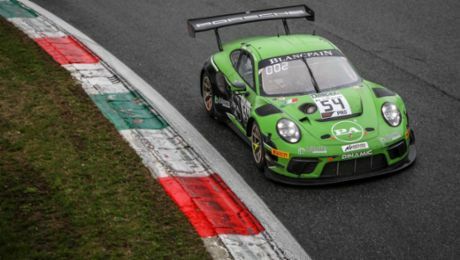 In just his second year as a junior, Müller also takes on the Porsche Mobil 1 Supercup in which he won the Monza race in 2014, and as last year’s rookie champion will also contest most rounds of the Porsche Carrera Cup Deutschland.